No Way Jose VS Cezar Bononi; Jose wins. 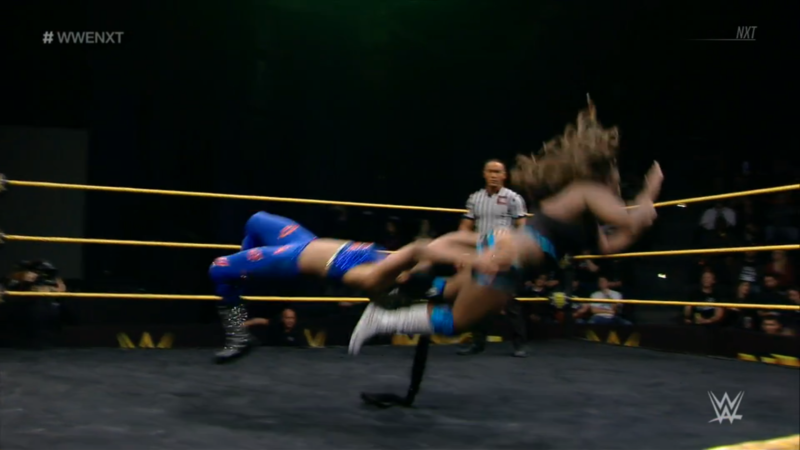 Bianca Belair VS Latoya; Bianca wins. The Authors of Pain VS Chase Brown & Damian Smith; no contest. NXT Championship #1 Contenders Match: Johnny Gargano VS Velveteen Dream; Gargano wins and will face Andrade “Cien” Almas for the NXT Championship at TakeOver: Philadelphia. The Velveteen Dream sets the mood. No Way Jose VS Cezar Bononi! The Fighting Fiesta returns to NXT and wishes to make 2018 a party! However, his return is against the Brazilian V8, who has been known to bring an upset out of nowhere. Will the fiesta be halted this early into the year? The bell rings and the two tie up. Jose gets a headlock while fans serenade him, but Cezar reverses. Jose powers out but Cezar powers him down to then gloat. Cezar runs and things speed up, Jose runs Cezar over now! Jose gets moving again and counters the leap frog with an atomic drop! He then arm-drags Cezar and wraps on an armlock. Cezar resists, he gets to his feet but Jose keeps him grounded. 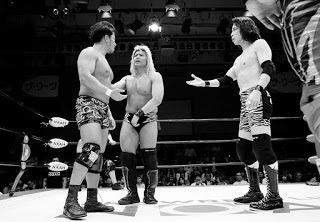 They get to ropes, Jose whips but Cezar reverses, Cezar grabs Jose’s hair and throws him down. Cezar knocks Jose back down with a dropkick, then stalks Jose to a corner. He stomps a Brazilian mudhole into Jose while fans cheer the Fighting Fiesta on. Cezar unloads body shots now, then brings Jose out for a pumphandle powerslam! Cover, TWO, and Cezar is merely annoyed. He drags Jose up but Jose resists, so Cezar drives in a knee. The chinlock is applied, and fans rally while Jose endures the squeeze. Jose powers up from the fans’ energy and fights back. Cezar shoves Jose, but Jose comes back with a swinging neckbreaker! Both men are down, fans cheer Jose on. Cezar stands up first, then goes over but Jose revives to give jab after jab, then the double ax handles. Jose rallies, powerslam on Cezar now! Jose takes off the armband and winds up the pitch… Pop-up Fastball! Jose wins his return match! Will 2018 truly be Jose’s year? 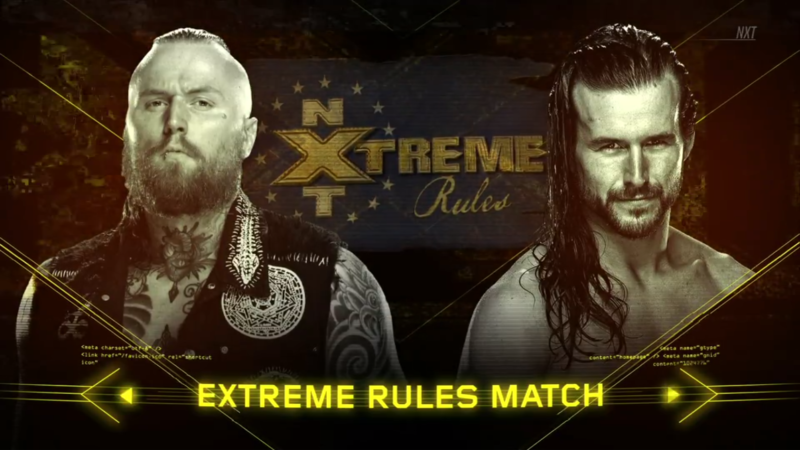 NXT takes a look at the coming Extreme Rules match. Philadelphia is the birthplace of extreme wrestling, and Aleister Black and Adam Cole are going to add their names to that extreme legacy. The Embodiment of the End started his journey 15 years ago and his journey is “far from over.” Meanwhile, Adam Cole’s grudge with Aleister Black started months ago, when the two competed for a spot in the #1 contender Fatal 4 Way. As great as Cole was in that match, Aleister was better, and he made Cole #FadeToBlack. Or, so he thought. 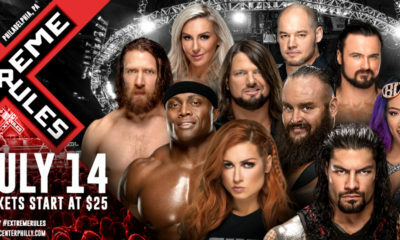 Because when that #1 contender’s match came around, Aleister’s opportunity was taken away when The Undisputed Era decided to #ShockTheSystem. After that, The Undisputed Era also screwed Aleister over in an NXT Tag Team Championship match. General Manager William Regal felt there was no other way to settle their grudge than in an Extreme Rules environment. Both men are ready to “mangle and embarrass” each other, which man will survive in the City of Brotherly Love? Ms. EST returns to NXT to further prove she is the strongest, fastest, toughest and best woman in the Division. Will she make this match look the easiest, too? The bell rings, Bianca and circles with Latoya. Bianca gets the waistlock and throws Latoya, then mocks her with a blown kiss. They tie up again, Bianca powers Latoya into a corner. Fans duel “Let’s go, jobber!” “Bi-an-ca!” while Bianca runs in, but Latoya dodges and tries to roll her up. Bianca holds onto the ropes, then goes to stomp. Latoya gets away but then gets run over by Bianca! Bianca stalks Latoya to a corner then stomps a mudhole into her. She dares Latoya to stand up, then rams her shoulder into her over and over. The referee backs Bianca off, Bianca drags Latoya out by her hair and then scoops her up. Latoya slips out, runs and goes for the tilt-o-whirl headscissors, but Bianca blocks with her incredible strength to give Latoya a backbreaker! Latoya writhes while Bianca looms over her, twirling that weaponized ponytail. Bianca toys with Latoya, then brings her out for a clubbing forearm. Latoya starts kicking back, but gets rocked by a right forearm. Bianca grabs Latoya in a double chickenwing and thrashes about. Latoya endures the hold, gets to her feet while the fans rally, but Bianca simply lifts her and throws her down. Bianca saunters about, not taking Latoya seriously. Latoya stands up, and evades in the corner to swing kick back. Latoya climbs up now, but jumps into that ponytail WHAP! Bianca drags Latoya up, and throws Latoya with the alley-oop facebuster! Cover, Bianca wins! Will she make the biggest impact in the NXT Women’s Division in 2018? Exclusive interview with the NXT Women’s Champion and Challenger. 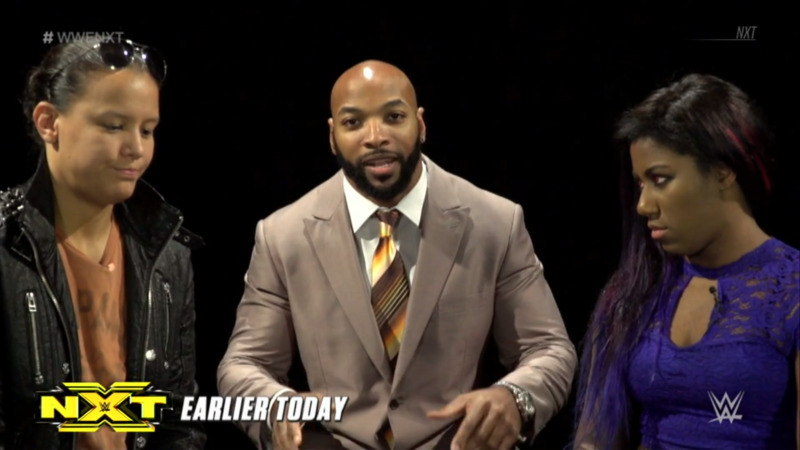 Percy Watson conducts the sit-down interview with both Ember Moon and Shayna Baszler ahead of their championship match this Saturday at TakeOver: Philadelphia. Percy congratulates Ember on overcoming obstacles to make it to this point, but he must ask: Why did she call out The Queen of Spades? Ember says it’s because Shayna has “been nothing more than a bully”. Shayna took shortcuts, jumped people from behind and injured fellow wrestlers. Is Shayna overcompensating because she can’t cut it? Shayna smirks at Ember, but Percy points out Ember has told the truth. Shayna explains it was never personal. She knows that “you have to stir up waters to catch fish.” Ember is that fish. Ember agrees, and she’s “the big fish” for a reason. This is HER NXT WOmen’s Division. There is a code here, and being champion means responsibilities to herself and the division. If Shayna ever becomes champion and sets aside her ego, then maybe Shayna will understand. But Ember promises it won’t happen at TakeOver: Philadelphia. What are Shayna’s expectations of TakeOver: Philadelphia? Shayna admits that Ember lived the dream of climbing up from the bottom and reaching the top. But the difference between her and Shayna is that Shayna doesn’t care about what people know. She worked just as hard as anyone. When Ember wakes up after TakeOver and sees Shayna walking away, she’s walking away with Ember’s dream. The tension mounts, but Percy diffuses it by asking what Shayna wants the NXT Universe to know about her. 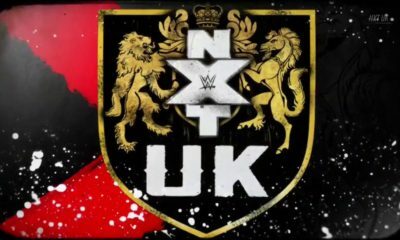 The NXT Universe? What they think doesn’t matter. They’ll just have to accept it. Shayna leaves, but the tension does not lower. Will the Prophecy of Flame be able to Eclipse the confident and dangerous Shayna Baszler? NXT continues their look into TM61. Shane Thorne reminds everyone TM61 is the name of a missile, and that is why they’re named that, NOT because of Pokemon! And like that missile, this TM61 flew in, hit hard and delivered some shock and awe when they debuted in NXT. They entered the Dusty Rhodes Tag Team Classic and were facing the team of Austin Aries & Roderick Strong. Circumstances called for Strong and Thorne going it alone, and Thorne found himself in position to hit Strong with a draping double stomp. He only hit half the stomp, and the landing caused his left leg give out at the knee. Nick Miller could tell it was bad, and Thorne himself knew it meant the coming TakeOver special was out of reach. Even so, Thorne powered through to win the match and earn TM61’s spot in the finals. “If you’re gonna be dumb, you gotta be tough”, and Thorne proved he was tough. The finals were competed in a Shark Cage tornado rules, where The Mighty put it all on the line. The Authors of Pain would win, but it wasn’t until a match with The Revival that Thorne’s knee was pushed past the limit in the form of the Deathlock stomp. Thorne was told his recovery time was no less than six months, but Miller was by his side the whole way. Thorne oddly thanks The Revival for toughening them up and allowing them time to grow stronger. The Mighty Don’t Kneel is not just a name, but a philosophy, and this duo truly lives it. They’re on their way back, and vow to prove that they’re STILL The Mighty, and the Mighty Still Don’t Kneel. Will The Mighty also become NXT Tag Team Champions? The Authors of Pain VS Chase Brown & Damian Smith! Akam & Rezar are primed to challenge the Undisputed Era for the NXT Tag Team Championships, and won’t even wait for a bell! They both boot their opponents in the head immediately! They don’t stop there, they take one man each in fireman’s carries, and drive them into corners via Death Valley Drivers! Now the Authors speak. “Undisputed Era! You see this!? You see it?! This is you! 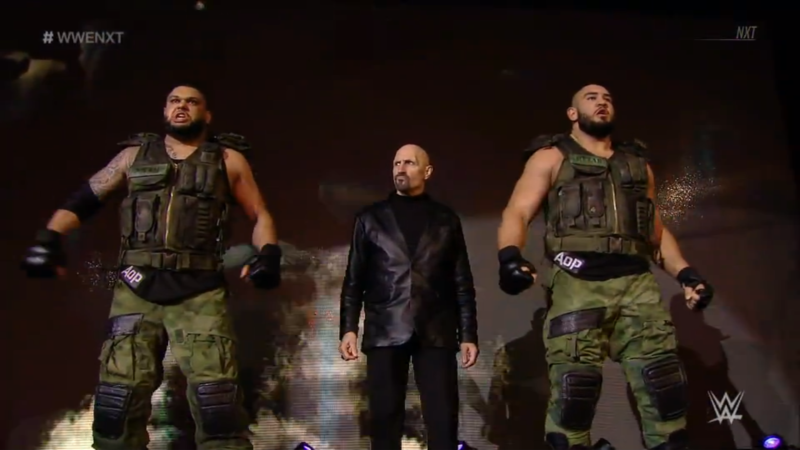 !” Akam continues in his native tongue as he vows the AoP will dominate. Rezar also speaks in his native language before shifting into English to say “This Saturday, it’s YOUR turn! !” In other words, the Undisputed Era will take their turn in the SUPER COLLIDER! 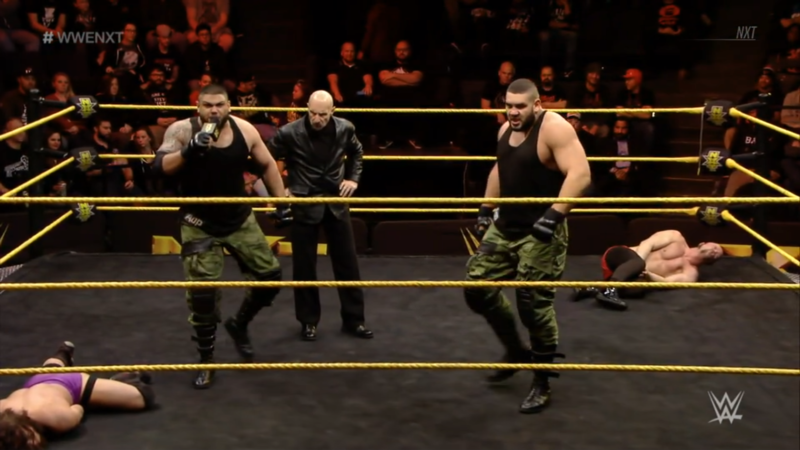 As Akam & Rezar stand over the fallen Brown & Smith, are we looking at the future two-time NXT Tag Team Champions? 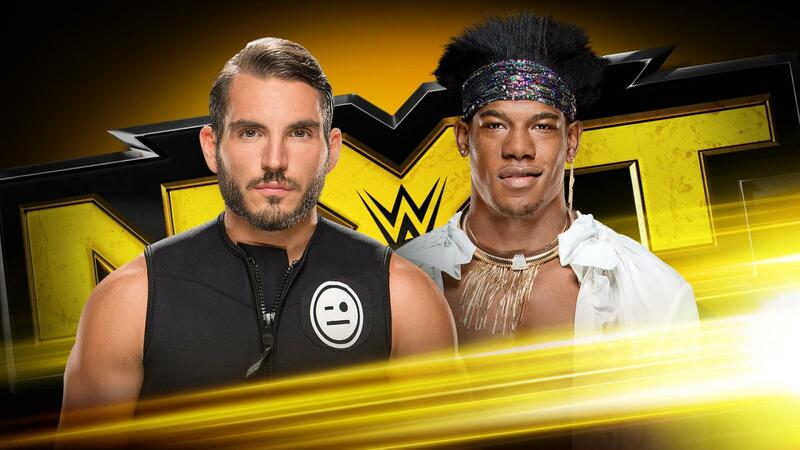 NXT Championship #1 Contenders Match: Johnny Gargano VS Velveteen Dream! Johnny Wrestling won’t stand for people doubting his ability or his integrity, but Velveteen Dream has done both. Will Gargano keep his dream alive when he denies this Dream from winning here tonight? Dream continues to play mind games as he wears a sample of Gargano’s merchandise to the ring. The fans already duel with chants, “Johnny Wrestling!” “Vel-ve-teen!” before the bell. The bell rings, the two men circle and tie up. Dream gets control of Gargano’s arm, Gargano rolls and slips around to a drop toehold. Gargano floats over to a facelock and holds on while Dream resists and rolls. The fans keep the chanting up the whole way, even as Dream tries every trick he has to get around Gargano. Dream manages an escape and facelock of his own, then manages to counter Gargano’s escape into a seated waistlock. They stand up, Dream snapmares Gargano then poses to taunt him. “You gonna cry?” Dream mockingly asks Gargano. “You’re not ready for TakeOver!” Gargano suddenly grabs Dream in the GargaNO Escape! Dream scrambles and flails, and manages the ropebreak. Gargano lets go, Dream slips out of the ring to catch his breath. Gargano taunts Dream now while we go to break. NXT returns to see Dream give a stiff back elbow to Gargano. Dream is free of the hold, then whips Gargano but Gargano reverses. Dream tumbles to the apron, but chooses to pose instead of reenter. Gargano enziguris him in the back to send him down! Dream’s face bounces off the announce desk, and while he flails about, Gargano gets to the apron. Gargano takes aim and FLIES with a cannonball senton! The fans fire up with Johnny Wrestling as he walks around. They chant “NXT! NXT!” while Gargano returns to Dream. Gargano lets Dream enter the ring while he climbs up to the apron. Dream swings but Gargano blocks and counters with a forearm. Gargano takes aim and slingshots in, but Dream catches his spear into a draping, swinging neckbreaker! Dream can’t make the cover, so he drives ax handles into Gargano’s head. He elbows Gargano in the back then covers, TWO. 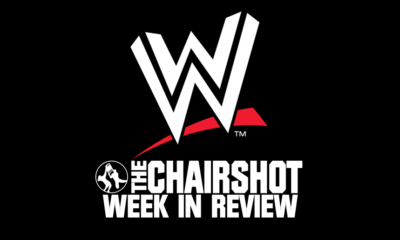 Dream keeps on Gargano with more elbows and more trash talk. “You don’t deserve it!” he says as he scrapes Gargano. Dream stands on Gargano to choke him at the ropes. 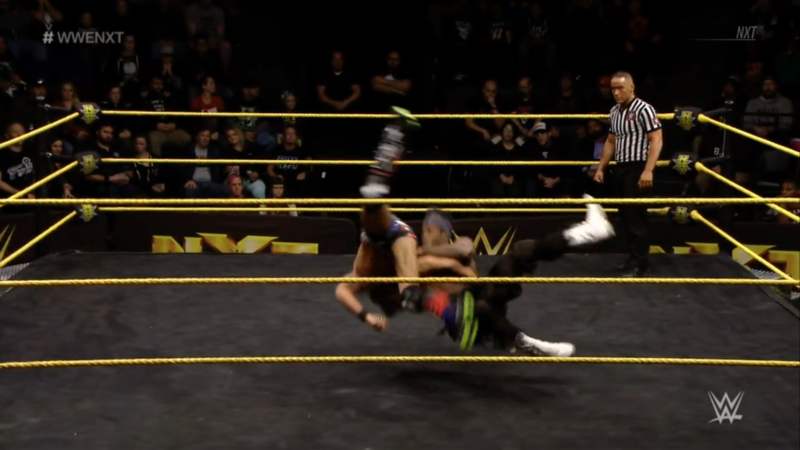 He drags Gargano up, but Gargano breaks the hold to power Dream into the backslide! TWO, and Dream kicks low before throwing Gargano roughly out of the ring. The ring count begins, but Dream won’t let it end that way. Dream climbs up to the top, but he’s just faking. He hops back down to the mat then goes out from the apron to ax handle Gargano. Dream drops Gargano on the ring barriers, then poses before hitting another double ax handle. He breaks the ring count at 8, Gargano chops Dream again and again! Dream fights back, and slams Gargano on the apron edge with a back suplex. Things slowly return in the ring while we go to break. 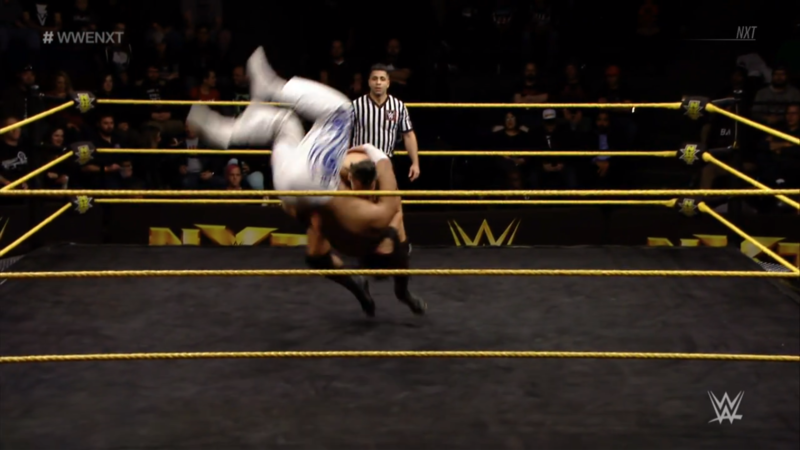 NXT returns again and Gargano throws haymakers on Dream. 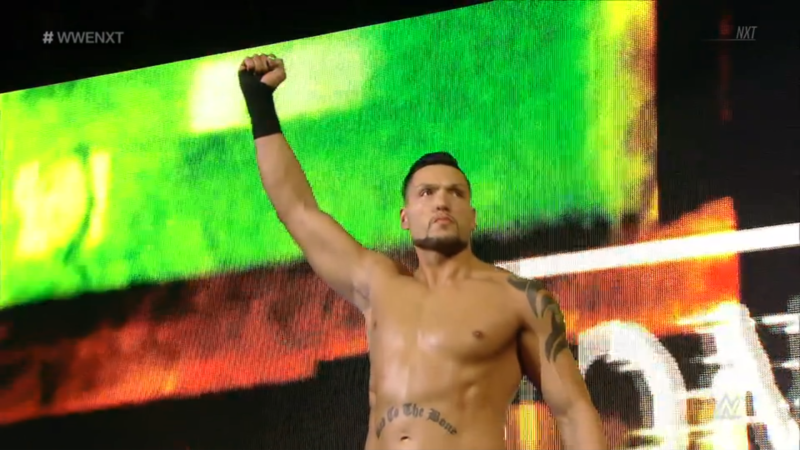 Gargano rallies now with forearms and an enziguri! Dream gets to a corner, Gargano gives him a forearm smash and whips him back into the buckles. Gargano rolls Dream for the schoolboy kick! Gargano hops up, takes aim, and jumps for the tornado downward spiral! Cover, TWO! 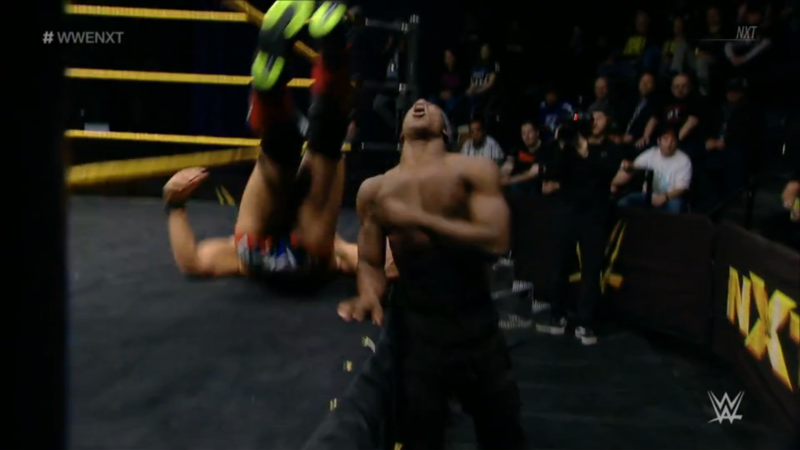 But Gargano isn’t deterred, he simply makes sure his neck works before going back over. Dream holds onto ropes, then clubs Gargano in the back. Dream gets a facelock but Gargano counters with an arm-wringer. Gargano walks back over but into Dream’s fireman’s carry. Gargano slips down to a sunset flip but Dream sits on it and even reaches for ropes! TWO, into Gargano’s cover, TWO, SUPERKICK from Dream! Gargano comes back with a left lariat on the rebound! Both men are down while the fans applaud. Gargano crawls to a cover, TWO! Dream and Gargano slowly stir while fans wish they could “Fight Forever!” Gargano goes after Dream, turns him around and stands him up for forearms from both sides. Dream lifts Gargano, Gargano flails and shoves Dream into a corner. Gargano runs in and hits a corner enziguri! He runs, tries for the tilt-o-whirl takedown, but Dream counters to stand Gargano up and hit the sidewinder DDT! Dream now crawls for the cover, TWO!! The fans applaud and chant “NXT! 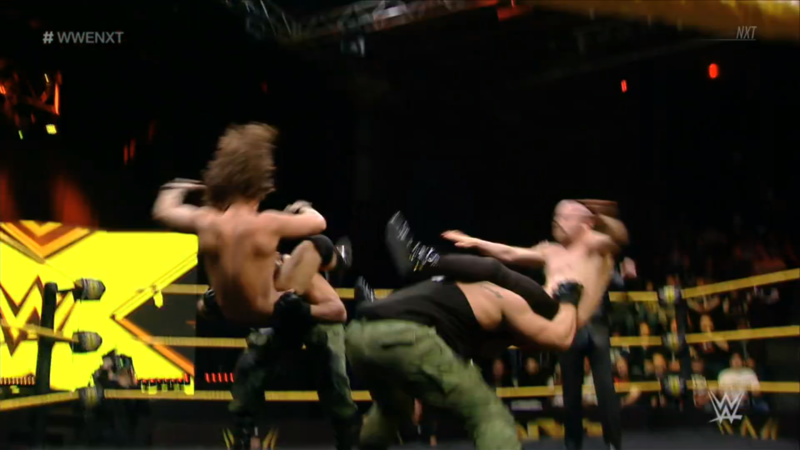 NXT!” while Dream scrambles to a corner. Dream climbs up, takes aim, but Gargano sweeps his legs to send him tumbling down in the ropes! Dream hits the floor, Gargano sees his chance. Gargano builds speed and DIVES! They both crash and burn into the ringside barriers! The fans keep up the chanting while Gargano drags Dream up and in. Gargano drags himself up onto the apron and then up to the top rope. Dream bumps the ropes to trip Gargano up! Dream then walks over and climbs up to put Gargano in a fireman’s carry. Gargano fights back with elbows to Dream’s head, but Dream powers through to hit the SUPER DEATH VALLEY! Dream crawls to the cover, TWO!! No one can believe it but everyone loves it! Gargano and Dream stir, Dream getting himself to a corner. Dream climbs up again, takes a moment to make sure his arms are okay, and jumps for the Purple Rain Maker! Only to hit Gargano’s knees! Dream writhes while Gargano gets himself to a corner. Gargano stands up, takes aim, and hits the mule kick! Then, back to the GargaNO Escape!! Dream taps, Gargano wins and is still the #1 contender! Gargano toughs it out here tonight, will anyone ever doubt him again? 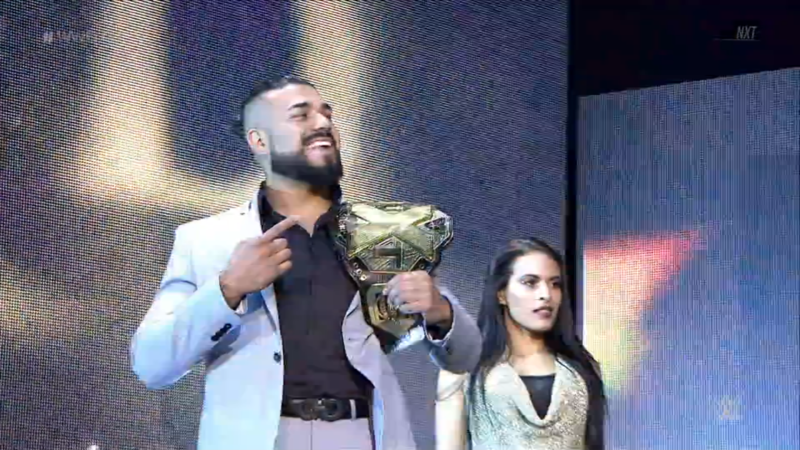 NXT Champion, Andrade “Cien” Almas, and his manager Zelina Vega appear. El Idolo sees his #1 contender and simply tells him with body language that the championship will still be his. Almas and Zelina continue to ringside, keeping their eyes on Gargano while also still grinning and laughing. Almas and Zelina now enter the ring, and Almas raises the belt while staring Gargano down. El Campeon then hands the belt to Zelina, and swings on Gargano! Gargano was ready, he blocks and counters Almas! The champion retaliates with forearms and a stiff overhand chop that drops Gargano. Almas laughs, Zelina says Gargano is nothing. The champion throws Gargano out of the ring while fans boo and jeer. Almas takes his belt back to hold it up again, as if to say the result is already final. However, Gargano drags himself back up, refusing to quick. Almas runs over but gets a swing kick! Then the slingshot DDT! The fans cheer the fired up Gargano while Zelina panics. Gargano walks over to the NXT Championship belt, the fans want him to “Touch it! Touch it!” And he does! Not only that, but with fans chanting “You Deserve it!”, Gargano raises the belt! Will this be the sight we see at TakeOver: Philadelphia!? This was an incredible night of NXT right here. 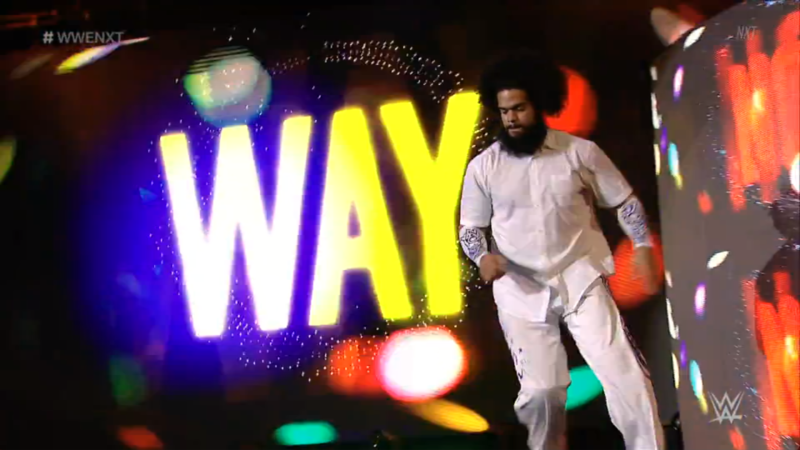 No Way Jose wins his return because obviously that’s how you start someone off. Cezar Bononi is approaching jobber to the stars status but he can easily turn this around with another shocking upset over someone else. 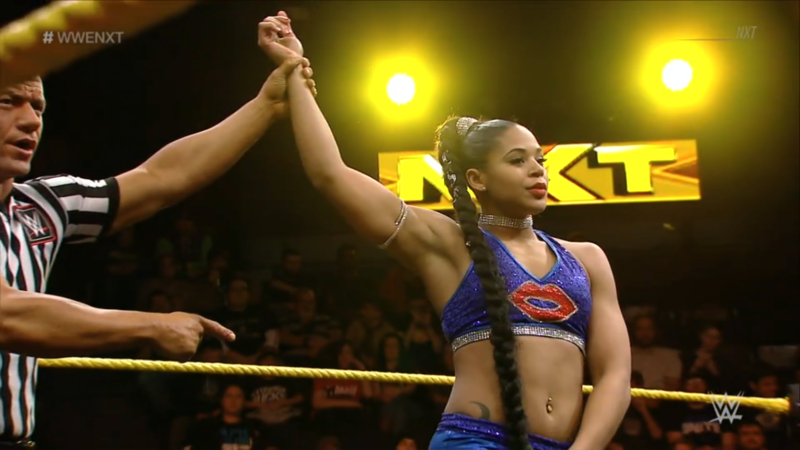 Bianca Belair is still impressive in a swift and dominant victory. 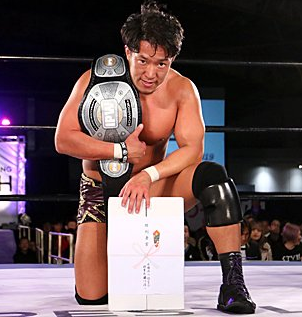 She was impressive in the Mae Young Classic–even in a loss to Kairi Sane–and has been impressive in general, she’ll be one to watch as the year goes on. Authors of Pain make even quicker work of their opponents, and show they have found their niche in talking on the mic. However, I don’t see them winning the NXT Tag Team Championship match, or at least not cleanly. Akam & Rezar are more than complete as characters and therefore ready to go to the main roster to try their hands at main roster tag team championships. Meanwhile, Kyle O’Reilly and Bobby Fish could easily hold those titles for a long time to fulfill the Undisputed manifesto, up until another team rises up to best them. 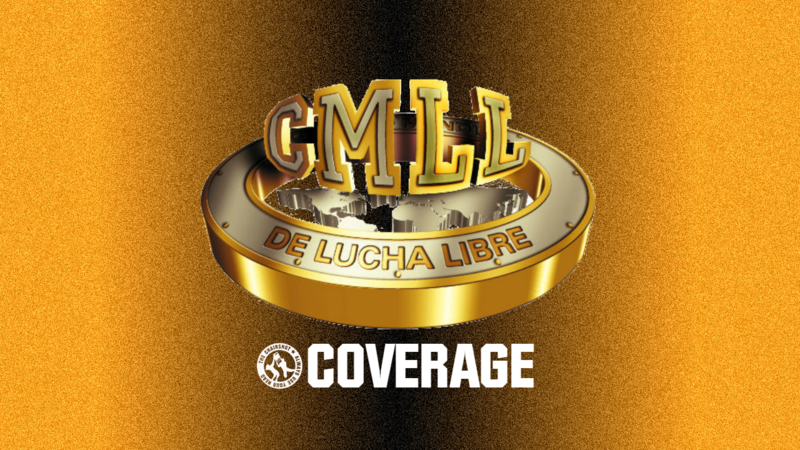 And given the video packages, TM61 could be that team. 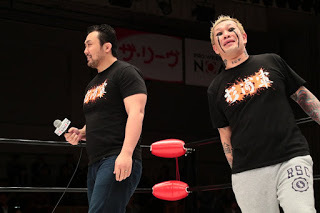 Thorne and Miller are great personalities, they’re great in the ring and they can reestablish themselves easily starting with their return match next week. 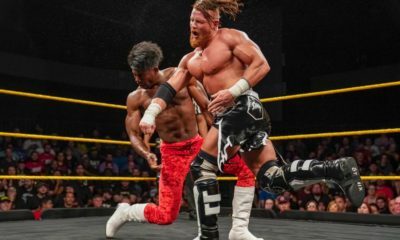 A team like TM61 could have an extended feud filled with lengthy matches against the Street Profits or Sabbatelli & Moss to drive home how they’re finally ready to be NXT Tag Team Champions. 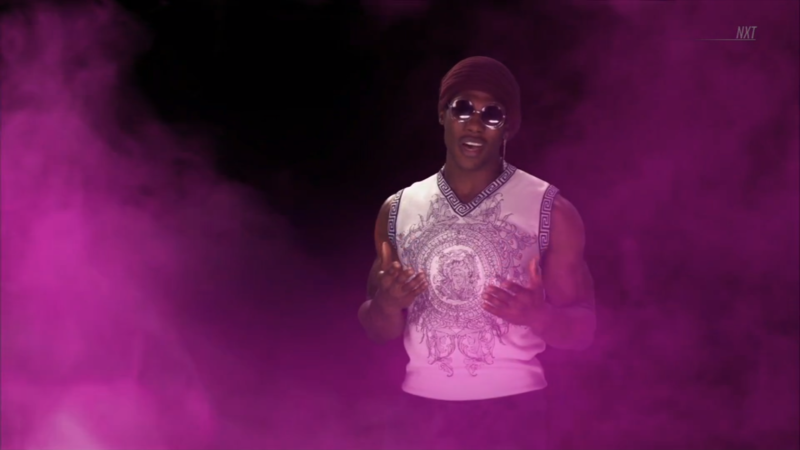 Velveteen Dream’s opening promo was great, especially how he transformed the performance center to fit his persona. He was also incredibly clever with the play on words with “over” within the context of professional wrestling. His match with Gargano was even on a TakeOver level with how back and forth it was with the various near-falls. Dream’s promo was correct in saying they would both be NXT Champion at some point, as Dream could easily be champion within the next few months to a year. However, because Gargano’s story is so strong and fans love him so much, he keeps his chance to challenge the champion. I didn’t expect Almas to come out, but once he did, I’d guessed he would try to beat Gargano up more. Great to see Gargano standing tall at the end, but this makes the already tough choice even tougher. We either get Gargano going 0-3 against Almas or Almas as a transitional champion, and I have no idea which is more likely. Which, is actually a really, really good thing!